1947 The Supreme Court ruled that the practice of block booking violated federal anti-trust laws. When the court failed to order the studios to divest themselves of their theaters, government prosecutors appealed. 1947 The Actors Studio, a rehearsal group for professional actors, was established in New York City by Elia Kazan, Robert Lewis, and Cheryl Crawford. It soon became the epi-center for advancing "the Method" - a technique of acting that was inspired by Konstantin Stanislavski's teachings. It later gained fame through the leadership of Lee Strasberg in the 1950s, whose clients included Marlon Brando, Marilyn Monroe, and James Dean. 1947 In Washington, D.C., the HUAC (House Un-American Activities Committee) opened its hearings for an investigation of alleged communist influence in the Hollywood movie industry. It subpoened 41 witnesses, its first wave of witnesses which included the 'unfriendly' "Hollywood 19" (13 of 19 were writers). In 1948, the "Hollywood 10" (Alvah Bessie, Herbert Biberman, Lester Cole, Edward Dmytryk, Ring Lardner, Jr., John Howard Lawson, Albert Maltz, Samuel Ornitz, Adrian Scott, and Dalton Trumbo) were charged with contempt of Congress and jailed for refusing to cooperate with its inquiries and answer the question, "Are you now or have you ever been a member of the Communist Party?" 84 of 204 supporters of the Hollywood 19 or 10 who signed an amici curiae Supreme Court brief were blacklisted. Many promising and established careers were destroyed by anti-Communist blacklisting when they were banished from the film community - reflected in the growth of sci-films showing paranoia of aliens and anything foreign in the 50s decade. 1947 Actor Ronald Reagan was elected President of the Screen Actors Guild (SAG) (a position he would hold to 1952), a US labor union established in 1933 to protect the rights of film and TV performers. Dedicated to stamp out Communism, Reagan pledged to notify the FBI of names of actors who were "communist sympathizers" in the film industry. On November 17, 1947, the Screen Actors Guild voted to force its officers to take a "non-communist" pledge. 1947 The Motion Pictures Code forbade derogatory references to a character's race. 1947 The Christmas-themed 20th Century Fox hit Miracle on 34th Street (1947) was released in theaters in late spring of 1947. 1947 Director David Lean's film Great Expectations (1946, UK), based on Charles Dickens' novel (and the first of two films Lean adapted from Dickens' works), opened in New York in 1947. It has been considered one of the best adaptations ever made of a Dickens novel, and one of the finest British films of all-time. 1947 Britain imposed a 75 percent duty on Hollywood films and the American studios responded by boycotting the British market. The boycott ended in 1948. 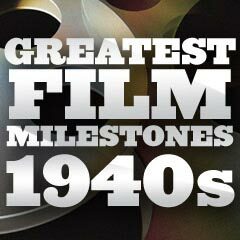 1947 The Golden Age of Hollywood peaked at 4.7 billion theater admissions in 1947. 1947 Tennessee Williams' play A Streetcar Named Desire, starring Marlon Brando, Jessica Tandy, and Kim Hunter, opened on Broadway on December 3, 1947. Two of the three main character roles in the ensemble cast reprised their roles in Elia Kazan's film version, A Streetcar Named Desire (1951), with Vivien Leigh replacing Jessica Tandy. 1947 Director Alfred Hitchcock's last film under contract with producer David O. Selznick was The Paradine Case (1947). 1947 German-born director Ernst Lubitsch, popularly known for making sophisticated romantic comedies and elegant costume dramas with "the Lubitsch touch," died at the age of 55 of a heart-attack. His last film, the musical That Lady in Ermine (1948) starring Betty Grable, was released the following year after being completed by Otto Preminger. 1947 MGM's Cynthia (1947) was the coming-of-age film for budding 15 year-old screen star Elizabeth Taylor, in which she played the title role of small-town, physically-frail, musically-talented teenager Cynthia Bishop. She received her first (grown-up) on-screen kiss from beau Ricky Latham (Jimmy Lydon) in a scene on a front porch following their attendance at the Spring Prom. RKO's and Edward Dmytryk's noirish message drama was a taut, intelligent and exciting melodrama and murder mystery. The blunt, honest and engrossing box-office hit was based on Richard Brooks' 1945 novel "The Brick Foxhole," although in the book, the victim was homosexual, not Jewish. It was a rare Hollywood social issue film - a landmark film and one of the first to indict anti-Semitism, prejudice and bigotry, along with the year's Best Picture-winning Gentleman's Agreement (1947). Other than Double Indemnity (1944), the picture was the only 1940s-era film noir to be nominated for a Best Picture Oscar, and notable as the first B-picture to receive a Best Picture nomination. It also influenced another thriller about bigotry, Bad Day At Black Rock (1955). 1947 Writer/director Aleksandr Andriyevsky's Robinson Crusoe (1947, Soviet Union) (aka Robinzon Kruzo), an adaptation of Daniel Dafoe's 1719 novel was the first Soviet 3-D feature-length film (in a process known as Stereokino that did not require anaglyphic glasses) that was also partly in color. 1947 Two controversial films in 1947 dramatized the social problem of anti-Semitism and religious prejudice: RKO's and director Edward Dmytryk's Best Picture nominee - the film noir Crossfire (1947), and 20th Century Fox's and director Elia Kazan's Gentleman's Agreement, a Best Picture winner. As a result, four individuals associated with the latter film were called before the HUAC -- Elia Kazan, actress Anne Revere, actor John Garfield, and producer Darryl Zanuck - when Garfield and Revere refused to testify, they were blacklisted. 1947 Vittorio de Sica's Shoe-Shine (1946, It.) was presented with an Honorary Academy Award in 1947, cited as "proof to the world that the creative spirit can triumph over adversity." Italy's Shoe-Shine was the first foreign film to receive a special Academy Award. 1947 was the first year in which an outstanding foreign film would be honored each year by a special non-competitive statuette awarded by committee. The Academy had no separate category to recognize foreign language films until 1956 when it established the Best Foreign Language Film category. The film also received only one unrewarded Oscar nomination, Best Original Screenplay.